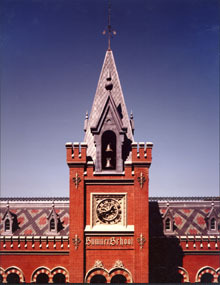 Venue of the Adolf Cluss Exhibition Project 2005 in Washington was one of the extant Cluss Buildings: Sumner School. The sections dealing with public and private education in Washington remain on view as a permanent exhibition at the Charles Sumner School Museum. The original exhibition panels can be seen on the Adolf Cluss Virtual Exhibition Gallery.